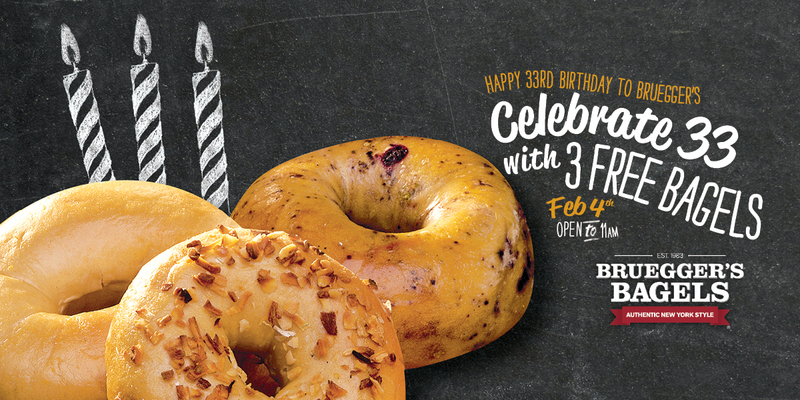 Bruegger’s Bagels celebrates its 33rd birthday on Thursday, Feb. 4, with its annual Three Free Bagel giveaway for each guest who brings a coupon to any one of Bruegger’s 290+ bakeries from open to 11a.m. Since opening its doors, Bruegger’s Bagels has baked authentic New York-style bagels at every location in small batches throughout each day using an original recipe with just five simple, wholesome ingredients. Guests may obtain the coupon by visiting www.brueggers.com and can choose from any of Bruegger’s Bagels 15+ varieties for their three free bagels.